Igor Shurov was born on the 30th of September 1958 in Kharkiv, Ukraine in the family of an officer and a nurse. Graduated from Vinnytsya pedagogical university (philological department). Worked as a school teacher, later as a teacher in medical university. Worked as screenwriter and editor of the popular ukrainian TV-channel 1+1 (Kyiv). 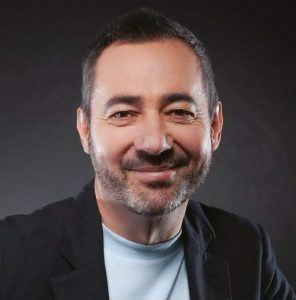 Worked as editor in chief of the ukrainian version of the most popular world TV-projects such as «Who wants to be a millionaire?», «Brainiestkid», «Fort Boyard» and others. Three fiction movies were shot by the screenplay written by Shurov. In the past ten years Igor Shurov actively creates graphics and paint-ings. He took part in several collective art exhibitions, such as «Gogol Fest» (Kyiv), in «Gallery on Pitarskaya» (Kyiv), in «Ivan Kavaleridze museum gallery» together with Ukrainian artist Viktor Rybachuk. «Ritual» in «6 level» art center (Kyiv), «Slowns» in Vozdvizhenka arts house (Kyiv), «Izhoracia» in «Gallery XXI» (Vinnytsya). Shurov’s paintings are taken to private collections in Ukraine, Israel, Germany, Great Britain, the USA. Igor himself determines the genre of his works as «out of genre», underlining the originality and creativity of his paintings. He’s a huge fan of naive art and art-brut (wild art). Igor’s friends determine his art works as «antidepressants», assuring seriously that Igor’s paintings deliver not only pleasure and joy, but also good influence on health. Recently published in Kyiv Igor’s fourth book, «Slowns», is very funny, smart and talented. It tells the story of good, often naive, but brave and fair creatures – slowns, who are never late because they are never in a rush. This book is also remarkable by the fact that Igor is not only the author of the texts but also illustrations. We can say this is not just a book, but a real album of art. There are more than sixty pastel paintings under the cover of the «Slowns». During last six years, art, joy, creativity and his beloved family help Igor to fight the heavy and incurable Parkinson’s disease.